#Geniushour was last week. Students products are posted here. 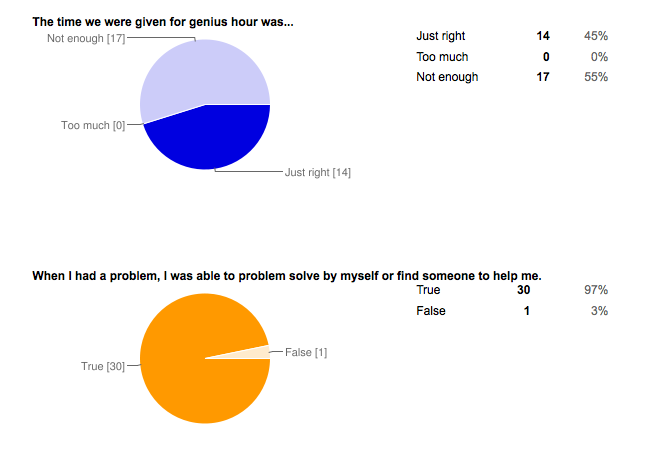 The following post has their answers to evaluation questions about their work during #geniushour. Like Tia’s class is doing this week, we actually ended up with about 100 minutes of genius. When asked to evaluate the time frame, more than half the students thought there was not enough time. It might have been better if people knew what they were doing before they started and not have just thought of something last minute. It would be better if people didn’t mess around and just got to work and knew what they were doing. How I think that genius hour would be better is that you could bring in new games for us to play so we learn something new every time. Genius hour would be better if it was on a Monday so we have something to look forward to because usually Mondays are long and boring. I think genius hour should be on Mondays, so Mondays aren’t so long for the class. To be able to have groups of maybe 4 or 5 at the most. When we made the collage out of our pictures that we had edited, some of the collages would change the way our pictures looked. We worked through it helping each other. Plus when we needed a scanner because one person didn’t have any digital pictures, we used the computer camera to take pictures of her hardcopy pictures. I learned how to film a video while we were acting. My group wanted to have someone else film for us, but we figured out how to do it without anyone filming. I learned that being independent is good. Trying new things is awesome. And I think everything went pretty good. Next time I will plan out what I would say in the video. I would have used 3 desks instead of 2, so it would be more sturdy and my project wouldn’t fall off. I would have used thinner wood for the birdhouse. I learned a lot about how the plane did not fly. Next time I would make something better. That I was able to learn about what I am interested in, not what we have to know and teachers going cram cram cram. I learned some of my writing limits. I liked that we were able to do whatever we wanted to try to contribute to the world. Getting to work with your friends, trying new things on the computer, having our own independent time to work. Acting out and filming the video. That we had plenty of time to get everything done. It was fun; we created some really cool things. Thought of things that I might never have thought of writing about. What I like most about genius hour is that you can do whatever you like from videotaping to coloring to learning about a new program. You can always learn something new in genius hour. My favorite part was seeing what everyone did. Making the bird house and filming it for others to see. I enjoyed Genius Hour. I think it taught us that we as 7th and 8th graders can change the world with our genius. This is great! I hadn’t really though of them doing a reflection afterwards. Great idea. I will definitely do this as well. What did you use for their evaluation? Did you have them do it online? Do you have a copy that you wouldn’t mind sharing? I think I will have them do it in our Edmodo site. I agree with more time. My students actually had more time because they were able to use a period to think about it and research (if they had finished all their work). This allowed me time to finish off my individual conferences for our report cards. One of my students came up to me today when I was on supervision to tell me that she and her partner had finished their 100 minutes of Genius already on the weekend. Isn’t that funny? I’m so glad for my PLN and that we can work together on this. Our experiences are better shared! I’ve included a link to the spreadsheet I used for their evaluations. Yes, I made it into a form and they answered online. The answers show up on the spreadsheet. If anyone wants to use it like I did, just File>save a copy of the link below. Then Insert>Form, make any desired changes, and get the published link at the bottom of the page. Send kids the link. 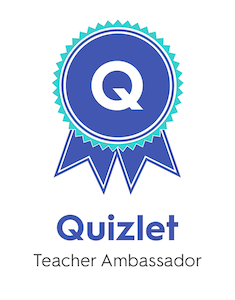 Or, of course, you can just use the questions on Edmodo or what-have-you. 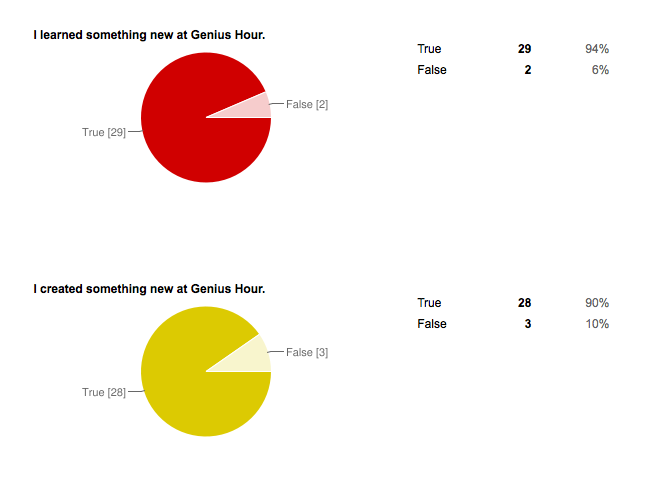 I love that 90% of the students said they enjoyed Genius Hour even though they didnt’ get a grade. Really powerful reflections. Have you decided how often you are going to have Genius Hour. 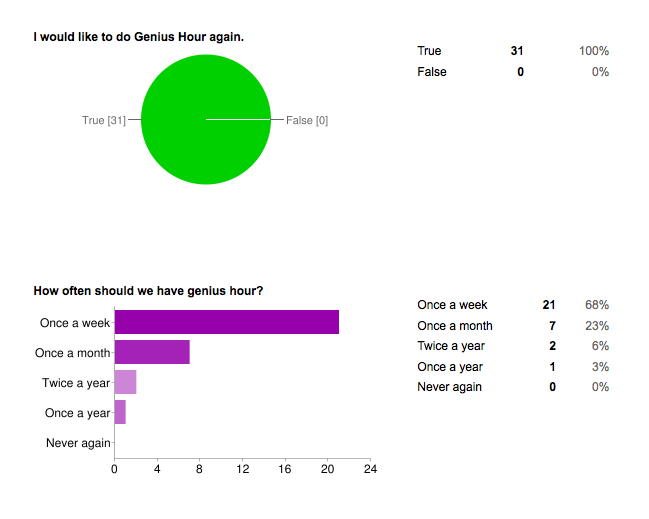 I noticed that one of the questions asked the students how often they wanted to have Genius Hour. The nice thing about it being on a regular basis is that students could take on bigger tasks and complete them over time. Thinking about the birdhouse builders, think about what they could accomplish during a number of different Genius Hours. Endless possibilities. I am uber intrigued. What you have compiled here is so valuable! Thank you for doing all this work! Thanks for imagining new ideas with us! It is exciting to think of all they can do, and I know their imaginations are sparked too as they’ve seen their peers’ work. Today, I started telling the students about how motivation works for creative activities of our choice. (From Daniel Pink’s Drive book–autonomy, mastery, and purpose. They seem to get it. I explained that the next genius hour they might choose to do the same thing they did this time and become even more of an expert at it (mastery), or they might do something totally new (autonomy–they can decide). No more “grade” purposes for us! (I’m starting to check out blog posts about the moratorium on grading.) Exciting! I love that we can do this work and share it with people who care. It is worthwhile to do it for my students and me, but it’s icing on the cake when others can benefit from it too. Thank you so much for visiting and reading and being on this learning adventure with me! Congratulations Denise on what seems to be a learning experience well received. The candid and honest reflections from the students speak for themselves. I think they really enjoyed it and learned from it. The ‘how can it be improved’ reflections I found interesting as those are some of the things you probably reflected on yourself. I like the idea that they wanted more room – to concentrate…makes sense – sometimes it’s too hard to focus with too much commotion. I’m sure you have some students already in the planning stages of their NEXT geniushour. I am so excited for you and your students. I’m wondering if I could try something like this with my fourth graders…..would be interesting! Yes, students are excited for the next one already! I am too. I think this is more like what school should look like. I’m sure 4th graders would be great. Check out Tia’s link that’s is included in the blog post. I’m not positive, but I think she may be doing #geniushour with 5th graders. She will be reporting more about it in another blog post too. I would love to hear about #geniushour from all ages of students. I have even found myself with a renewed interest in play and learning since we started. Surveying their attitudes to measure effectiveness, and to hear their voices, is superb. I would love to see teachers try this in our school district… and I’d love to try it for staff development. Thank you so much for enlightening me, and for trying something new. I have appreciated all the posts on this, and watching it evolve. I was wondering if your student think it would be effective with kids younger than them? If so, how young? What about older? — I ask because my school district is K-12, and I wanted their insight. Thank you, Mrs. Watanabe! I will ask them to answer your questions. I don’t think that if you did genius hour with younger kids it would work, because a lot of people did movies and building things. They could make their own board game or game. It would work really well with older people because they could have better ideas and they are more responsible. It could be pretty fun for kids older than 6th grade. You should try it. It was fun and I learned how to make a movie. Thanks for leaving a comment for Mrs. Watanabe. I know she will appreciate it. I think you make a good point about older people being more responsible. They would be more able to work independently than young children, wouldn’t they? For instance, you were able to walk all over the building without supervision making your movie. However, when I read your blog post and was reminded of all the different things our students did, I was reminded that no age is too young to learn something new. They might not be able to make a movie about it, but I would hate to have to tell young students that they are future geniuses, but they have to wait until they’re in 7th grade to practice it. What do you think? Hey Mrs. Watanabe, I think it would be a great idea to do genius hour with all different ages. For younger kids, I think what they would have to do would change, but they could still do it. They would just need some more help. We all have ideas, each age would just have a different way of showing them. I think that genius hour could go for any age. The little kids are probably going to need a little more help, but I don’t think that really matters. Little kids haven’t experienced as much as older kids have, so their ideas are going to be hard for them, but for us they may be easy. In my opinion, you are not to young or too old too do genius hour. Thanks for your feedback! I think you are right. They’d need to learn many things first, such as how to work in groups; what to do if they need help; and how to work with the technology/equipment before they could work on their own. I know I could do it with 3rd grade and up, but I’m unsure about K-2. It would depend on if they’ve worked in groups first. Plus, the products they created would be based on what they knew, so that too could be different based on age. Do you have any other tips for what students need to experience before doing a genius hour? Thanks for your time answering my questions! OK, so here we are again today…I passed my computer and let a few people share a tip for getting students ready for genius hour. I think what you should do is make sure the students have a game plan. Then you should make sure they have what is required (if it’s on a computer, anyway). After that, I believe you should let them use their imagination. Be sure to tell them that they can do whatever they want. They should do what they are interested in. I think it would be smart to talk to them 2 days or so before genius hour so then you can give them a couple off days to plan what they’re doing. It also would be fun if you get someone to tape everyone and make it into a movie of what everyone was doing. I hope you have fun doing this. I hope we can do it again! I think that your students need to know that they are able to be geniuses. You need to tell them that they are geniuses, so they can use their creative mind for genius hour. I think genius hour is a good way to get kids to share their creativity. I think that they should be able to know a couple days ahead so they can plan what they want to do. I completely understand about not being logged in and losing all the time spent on commenting. Sorry to hear it happened to you with the response to me. I’ve done that many times. Or, I’ll comment and realize later that one of my kids were logged in last and I left the comment with their avatar/ account. Yikes! 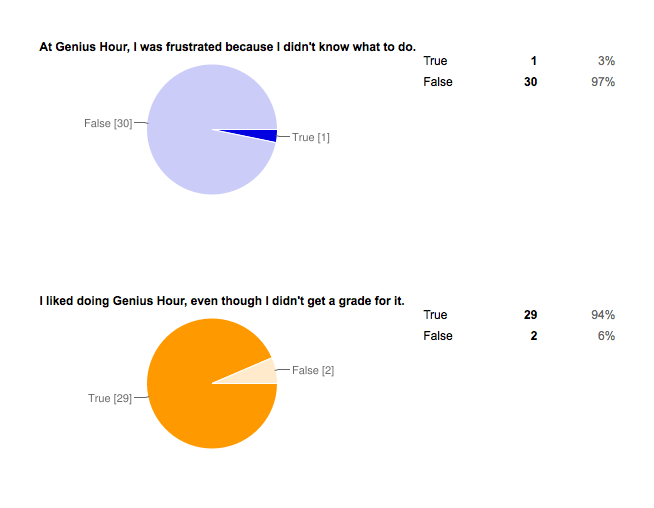 I am impressed with your students feedback and it’s very helpful for thinking through how to plan a genius hour with students (or with the teachers). @ Paige, knowing what you are doing is key. That’s why I always like to remind students to write their goals/plan. For teachers, I ask them the same, and I also ask them to create what they’d place on the rubric so they’ve thought through it enough and know the direction they are going in. That plan helps manage the direction and the time, whereas without a plan, it’s easier to get sidetracked. — Thanks, Paige, for this reminder! @ Anna, the game plan is key, isn’t it? (See my comment above @Paige). You are right, the teacher/student group should help think through if all the supplies/resources are available. As far as the tech goes, certain devices have certain restrictions, and knowing how to stay within those parameters or being able to think of adaptations that will work for you is key. Yes, letting the students create with their imagination is key. I fully believe in letting them use their strengths and pulling their strengths together to make something amazing. @Madi, Thanks for the insight of reminding them they are not doing it for the teacher, but doing it for their own creativity and interests. @Becca, your tip for giving them time (2 days or so) to process their thoughts and think of how they want to use that time is key. I also like the idea of documenting it for others to see. I wonder if when groups stop to conference, and as they come to conclusions about the next step, if they were to go “tell” the video station their thoughts/insight before moving on, if that would work. — I hope you get to do this again also! @Paris, So true, the students do need to know they are geniuses and that geniuses create. Your point of explaining so they believe in their genius is valuable. Thanks for your insight. @Grace, I thank you for your insight of giving them time to think about what they’ll create is key. It helps them create their concept plan and work through their brainstorm. All of the above insight is very appreciated. I will use this as I plan for a “genius hour” to train other teachers, and hopefully to have teachers plan a “genius hour” with their classes. As always thank you for your time and thoughtfulness in your care-filled responses. 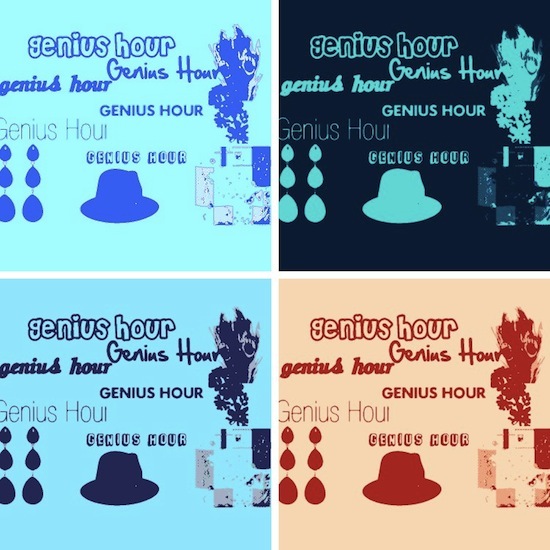 We will be anxious to hear how genius hour goes in Arizona–with teachers and/or students! I think that Genius Hour can be done with any grade, really. It is really powerful. The biggest thing, I think, is taking the step to just try it. It is difficult giving control over of the learning over to the students, but they can do it! I did my 100 Minutes of Genius with Grade 5 and 6 students. It worked out very well. They will be completing the evaluation that Denise has here this week. Looking forward to seeing the results. Thanks for the inspiration, Denise! I agree, Tia! All ages can and should be learning something new and making decisions on being a lifelong learner. Thanks for the input! I can’t wait to read your results!